ABD architects bureau is completing the project of a new residential district in Lipetsk at the moment. The client is Novolipetsky metallurgical plant – the largest and one of the most successful industrial companies in the city, this fact though does not guarantee realization of the project but requires quite a high level of living standards for the future district. 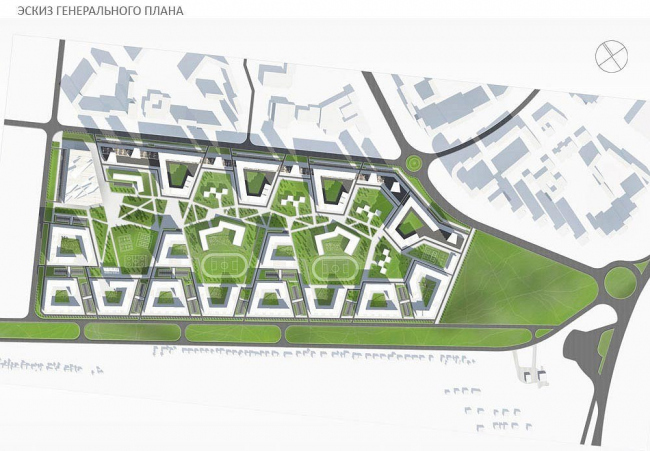 This is the first experience of complex development of a territory in the region, and the developer reasonably expects that such approach will refresh new housing developmens in Lipetsk at large. 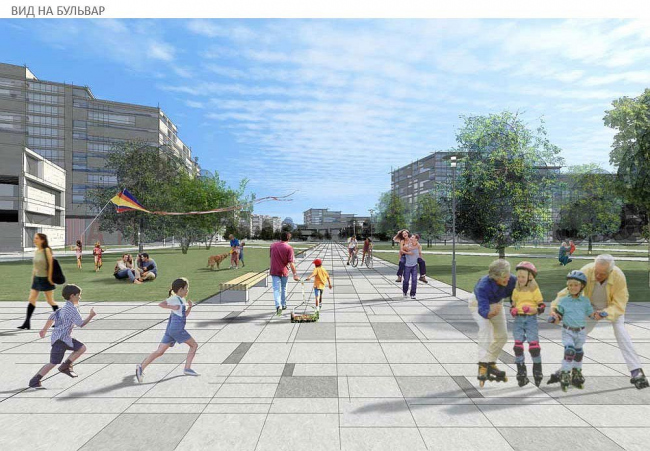 The building site borders with Sviridova, Krivenkova and Minskaya streets, notably, the last one is one of the largest streets in that part of the city and is a multilane carriageway with a green pedestrian boulevard in the middle. Minskaya street also plays an important role in urban development: in fact it is a border for the new housing areas in the south-east of residential part of Lipetsk and private housing development, a diverse area of cottages along which the city smoothly transfers into a countryside. 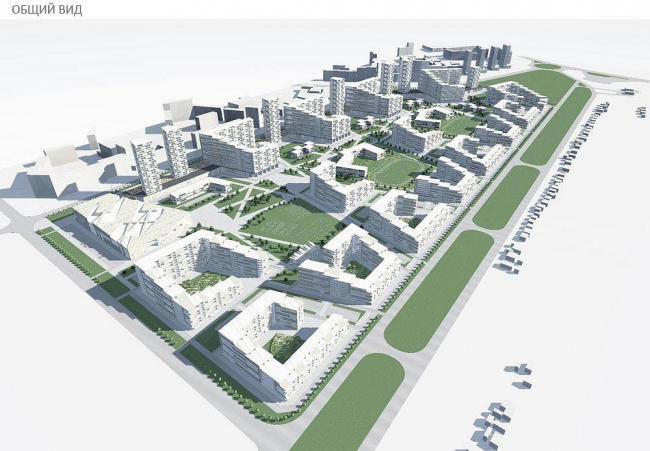 The architects were challenged to reflect in the district image its location and visually shade a jump from low-rise housing to multi-storey apartment towers. Being green Minskaya street set the second theme – the master plan of the new district is full of green spots. Basis of the new district master plan is an evident hierarchy of the spaces: private (inner courts), areas with limited access (territories around buildings) and public. 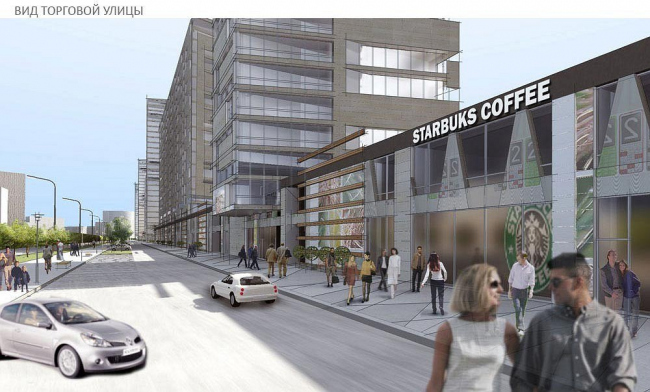 There will be a pedestrian boulevard in the centre of the district. Nominally it is parallel to Minskaya street, but in fact it has a complex layout and has numerous interlaced paths, and this allows to create a net of ways and gives to their views an interesting space intrigue. The broken line of the boulevard is repeated by the outlines of the schools located alongside, they are Г-shaped volumes placed at an acute angle. 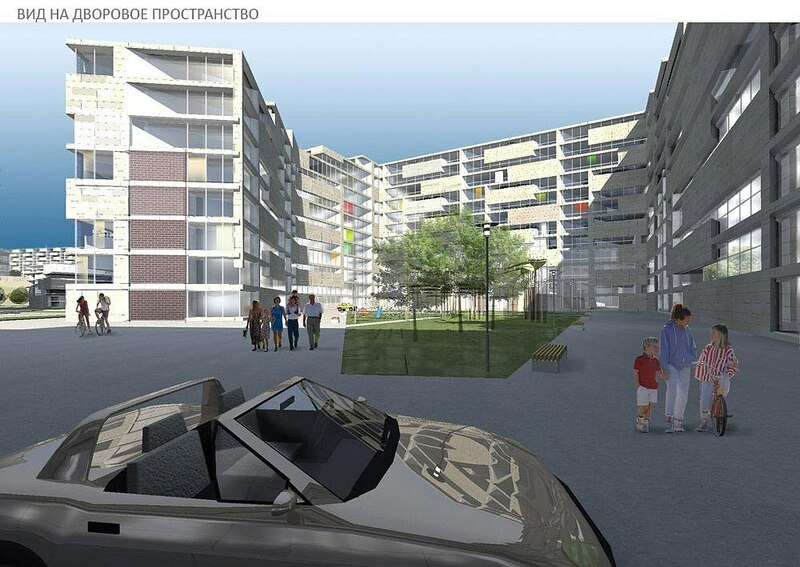 All the residential complexes are designed individually and consist of blocks of different heights – so within each city-block there will be diverse and compound environment, and in the context of the entire district there can be marked a number of dominants, which then will become landmarks for the residents. Each city-block passage will have open 2storey car lots, for every building, so this will help to avoid accidental masses of traffic in the inner courts.